How did Charlie Chaplin become aware of Edna Purviance? No one knows for sure! But, here's a wonderful bit of chance and speculation... Chaplin might have seen Edna's picture in the newspaper! The is Part Five of a Six Part research article. Click to view the entire series on the EdnaPurviance.org site. Edna was enjoying the party of her life at the Civic Exposition Ball on the evening of January 9, 1915. It was likely the biggest public social event she had ever attended. The next morning, Edna could have read about the event as she relaxed after the all-night, dance-til-dawn affair. That same morning in Illinois, Chaplin was reading the Chicago paper about his own special event - an interview, about HIMSELF! ‘‘Charles Chaplin, a Modest Violet Scared to Death of Publicity", was the headline on the top of the theater section of the Sunday Chicago Tribune, January 10, 1915. Charlie Chaplin 1915. Photo: Hill Family Collection Copyrighted. 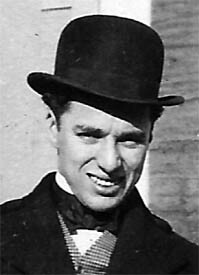 Chaplin was not one to cozy up to the press and would shy away, especially in his early years. The interview occurred about four days earlier, with G.M. “Bronco Billy” Anderson present. Chicago reporter Mae Tinee visited the Chicago Essanay Studios and she was led by an Essanay staff member to a room where Anderson, Francis Bushman and others were seated watching Anderson’s latest film ‘When Loved and Honor Called’. "Is he here?" Tinee asked. They spotted a small man in one corner. It was Charles Chaplin. Tinee cornered Chaplin just as the lights came up after Anderson’s film. Charlie couldn’t escape. "Mr. Chaplin?" Tinee said. "I guess there’s no use denying it. Glad to meet you. Now where shall we go for our talk?" replied Charlie. Chaplin was not in any mood for an interview. He and Anderson had been in heavy discussions about money, the studio, and finding a new leading lady. Only a hint of frustration showed up in the interview – his mention of missing working in California. It was a clue to which he would follow up on in the coming days. G.M. Anderson left Chicago for New York on January 7th to most likely discuss these matters with George K. Spoor, head of Essanay. According to Chaplin, Spoors did finally show up in Chicago to iron out the money problems and give Chaplin the option to choose another Essanay studio location. ‘‘How would you like to go to Niles?" Spoors asked Chaplin. Chaplin had not been thrilled with his experience in Niles when he saw it on the way to Chicago, but he liked Anderson who worked out of the Niles studio. Chaplin made his escape from the weather and confines of the Chicago studio. Just a few days after the published interview, Chaplin was abroad one of the Chicago trains bound for Oakland Pier Station, located across the bay from San Francisco. Once again he most likely bought a first class ticket on the most direct route between Chicago and San Francisco – the Overland Route. It appears others made the trip with him. Ben Turpin, Leo White and Bud Jamison appeared in Chaplin’s first Essanay film ‘His New Job’ filmed in Chicago, yet were right at work again on Chaplin’s first one at Niles. No leading lady would join the crew heading west. Gloria Swanson hadn’t been impressed with Chaplin’s style of humor. Charlotte Mineau would join Chaplin’s company later. She was a good actress, but not the type Charlie was trying to find. No girl had followed him out of Keystone. Nearly three weeks in Chicago hadn’t produced a new leading lady. He now began searching for his new actress from the city by the bay. He had over 60 hours on that train west to think about his first move at the Niles Studios. Chaplin hit the ground running once he got to Niles. He had a new picture to work out, a crew to hire and a girl to seek out – a very tall order – in very short time. Finding a leading lady topped the list. Chaplin was looking for a girl with beauty, charm and humor. The girl had to be able to follow his careful directions, and had to be punctual and responsible. She had to be many things in a perfect world. But finding someone, anyone, might have to suffice, especially if she were pretty. Chaplin felt he could work around the rest. Southern Pacific Overland trail route Charlie Chaplin traveled through Northern Nevada and through Lovelock. For Chaplin, it was a train trip of over 2200 miles between Chicago and San Francisco, with many stops in between across plains, mountains, cities and deserts. Chaplin has experienced a whirlwind three weeks, with travel between Los Angeles, San Francisco and Chicago. He created a film in Chicago and now was enroute back to California. Sleeping could have filled many of the miles as he again traveled through Lovelock on his way to the Bay Area. It is written in David Keihn’s book, ‘Bronco Billy and the Essanay Film Company’ that Charlie Chaplin left Chicago on Thursday, January 14, 1915 for San Francisco. If that date is correct, Charlie would not have arrived at Oakland Pier Station until late Saturday January 16th, at the earliest. I have examined the train schedules and travel time between Chicago and San Francisco for January 1915. The fastest route took just about three days of travel. That was true for the fastest trains on the most direct routes – the San Francisco Limited and the Overland Limited. This detailed information helps us understand the actual time frame for Chaplin to do all the things he had to do in those first few days in California. In Keihn’s book, Chaplin started filming at Niles studio on Monday, January 18th. If this is the case, Chaplin spent Sunday just settling in at his new home in Niles. Chaplin mentioned in his book he ordered a cafe set to be built, and hired some of the new crewmembers. The sets had been started at that time or possibly before Chaplin left Chicago. After the quick settling in, his thoughts turned to the crucial task of finding a leading lady. By our schedule, Chaplin arrived in San Francisco on the evening of January 16th, or possibly early the next morning, a Sunday, January 17th, 1915. Charlie was fond of relaxing with a cup of tea while reading the morning paper. Sunday was the day of the week when all the new theater shows for the week were listed. He and G.M. Anderson would later view various shows looking for a leading lady among the showgirls, but they didn’t find any prospects. There were a few different newspapers available, but the San Francisco Examiner was one of biggest to publish on Sunday. If Charlie Chaplin did look at the Examiner that morning, and turned as usual to the theatrical section, those listings were printed on the left-hand side of the newspaper. Opposite that was the day’s Society page. And by his right hand, the largest photo on the page, was the image of the girl who would become his new leading lady.